An economic but effective line of sight microwave link system consisting of a varicap tuned Gunn oscillator with horn antenna, modulation pcb, Digital AFC'd PLL'd tuner, LNB, cables and power supplies. A cost effective rock solid, auto tracking, amazing performance solution when you need to send your audio over some distance. Outstanding signal to noise! Setting up is as easy as pointing the transmit antenn at your transmission site and then pointing the LNB back towards your studio. Sit back and enjoy the quality of 'direct connection sounding' microwave technology. The standard system will link over line of sight paths of over 5 miles. This range can be increased to over 10 miles with the addition of a dish to the receive end. The baseband (audio) input can easily cope with a variety of input signals from simple mono audio to multiplex stereo. A 10.31-10.36 GHz version is available for licensed use in the UK. Contact the sales team for more info. 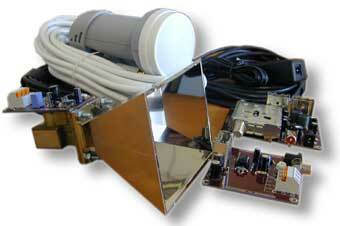 Every thing is provided in the box for plug and play operation, even cables and power supplies. This system employs varactor tuning for a minimum of 10dB extra performance on distortion figures. The receiver has digital AFC to track the transmitter signal without adding distortion unlike cheaper analogue resistor/capacitor methods. Do not confuse this system with other systems that simply modulate the gunn diode voltage and employ no or poor receiver AFC methods. The Gunn oscillator and driver pcb option contains the Gunn oscillator on a pcb together with the audio modulator driver pcb. This option is for people who want to make their own TX link box but don't need the recieving part of the system. Output Power (gunn) 10mW min. 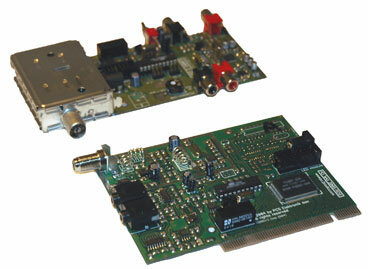 An economic but effective and stealth small distance VHF link system, consisting of a PC transmitter card (a PCI card with link transmitter) and a dedicated microprocessor controlled receiver. A cost effective, stealth (link transmitter is inside a PC, but can also work in stand-alone mode), rock solid (PLL controlled) small distance link system. A very cost effective solution for sending your audio up to 10 km far (requires clear sight of view with high-gain directional antennas). Link transmitter includes stereo encoder (it can be disabled with a windows program), which means you get a full MPX signal at the receiving side and your main transmitter can be mono, minimizing your potential losses. Both receiver and transmitter use standard TV antennas, which can be inexpensively purchased in high-gain configurations! Specify frequency band under comments when you place your order! Receiver is universal!